Happy Birthday, Nintendo! Thanks for stealing my childhood! 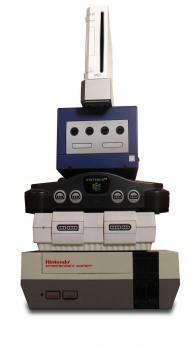 A tower of entertainment: Although I notice that both Hanafuda and theVirtual Boy are conspicuously absent. (image courtesy of Wikimedia commons)I never had a Nintendo as a child, actually, I just thought about it all the time. Anyway, today (or technically yesterday - it's late) is Nintendo's 118th birthday! On September 23, 1889, Japanese businessman Fusajiro Yamauchi formed the Nintendo Koppia company to produce the Hanafuda card game. It wouldn't be until July of 1983, just a few days after I myself was born, that the company released the Famicom, aka the Family Computer system, aka the Nintendo Entertainment System, home some of our generation's greatest heroes: the Mario brothers, galactic bounty hunter Samus, elfin androgene Link, and the Bionic Commando himself. Thanks so much, Nintendo, and happy birfday.